Complete balanced, encapsulated electrolytes, which wont aggrevate an stomach prone to gastric ulcers. Essential electrolytes are listed below, and it it essential that these are replaced at the same ratio as they are lost. 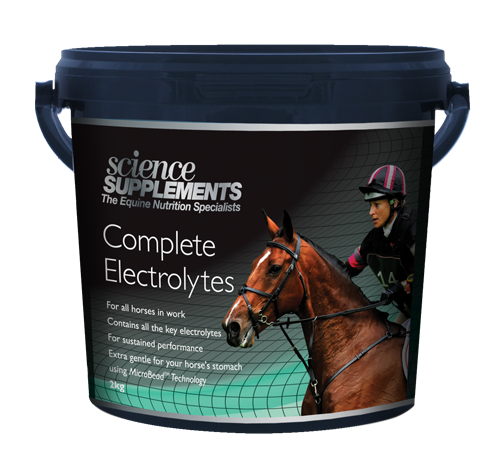 Electrolytes should be supplemented to a horse when he or she sweats, this includes when training at home. Horses cannot store electrolytes, but daily losses should be accounted for as you go along. It is advisable to dose your horse with electrolytes as soon as possible following exertion, supplementation should continue for 3-5 days following the exertion. Drinking water MUST be accessible at all times after electrolytes have been given.